In November 1915, Sir Ernest Shackleton watched horrified as the grinding floes of the Weddell Sea squeezed the life from his ship, Endurance, before letting her slip silently down to her last resting place. Caught in the chaos of splintered wood, buckled metalwork and tangled rigging lay Shackleton’s dream of being the first man to complete the crossing of Antarctica. Shackleton would not live to make a second attempt – but his dream lived on. 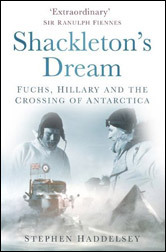 Shackleton’s Dream tells for the first time the story of the British Commonwealth Trans-Antarctic Expedition, led by Vivian Fuchs and Sir Edmund Hillary, the conqueror of Everest. Forty years after the loss of Endurance, they set out to succeed where Shackleton had so heroically failed. Using motor-sledges and converted farm tractors in place of Shackleton’s man-hauled sledges, they faced a colossal challenge: a perilous 2,000-mile journey across the most demanding landscape on the the planet, where temperatures can plunge to a staggering -129°F and bitter katabatic winds rush down from the high Polar Plateau carrying dense clouds of drift snow, which blind and disorientate. This epic adventure saw two giants of twentieth century exploration pitted not only against Nature at her most hostile, but also against each other. From their coastal bases on opposite sides of Antarctica, the two leaderspushed south relentlessly, dodging bottomless crevasses and traversing vast, unexplored tracts of wind-sculpted ice. Planned as an historic (and scientific) continental crossing, the expedition would eventually develop into a dramatic ‘Race to the South Pole’ – a contest as controversial as that of Scott and Amundsen more than four decades earlier.